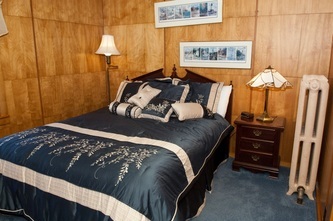 The Blue Suite offers a sitting room, separate bedroom with a queen bed, and full private bath. Located on the second floor and the north side of the House, it has a great view of the north gardens. A fireplace has been added to enhance the ambiance of The Suite. Guests have access to the decks and the gardens to enjoy the views of the lake and flowers. The Blue Suite is a wonderful suite for those who are looking for a reasonable place to stay with amenities while exploring the area and Bayfield. 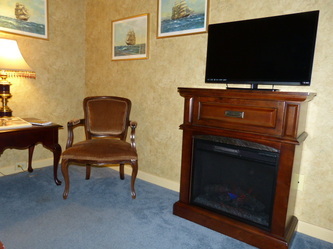 Amenities include coffee options, microwave, refrigerator, flat screen TV with cable, and free wi-fi access. The guests have access to the sitting area, sun room, and the numerous garden spots created for guests to enjoy.